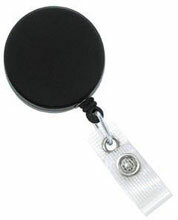 2120-3300	 Reel, Badge Reel, Black /Chrome, 1-1/2" (38 mm), Heavy-Duty Badge Reel with Cord and Reinforced Vinyl Strap, with Slide-Type Belt Clip. Sold in quantities of 25. Priced per 25 units. Call for price. The Brady 2120-3300 is also known as Brady People ID	2120-3300	or 21203300	.